Casa Milagro is an exquisite Spanish colonial adobe home, (3 bedrooms, 3 baths, 2-car garage) lovingly restored in southwestern style with hand-hewn beams, imported doors, luscious chandeliers, sculpted ironwork, imported Spanish tile, and a wood-burning fireplace. French doors and large windows open the interior. For breakfast, an outside deck; for evening margaritas, a colorful outdoor portale; for dinner, a gracious dining room; for a restful pause in the day, a lovely landscaped court yard with a waterfall. You will be within walking distance of over 15 Restaurants, many Bars, Galleries, Shops & Museums. 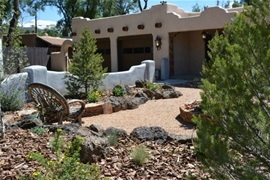 Very Convenient to Taos Ski Valley, Angel Fire, Red River and Santa Fe. 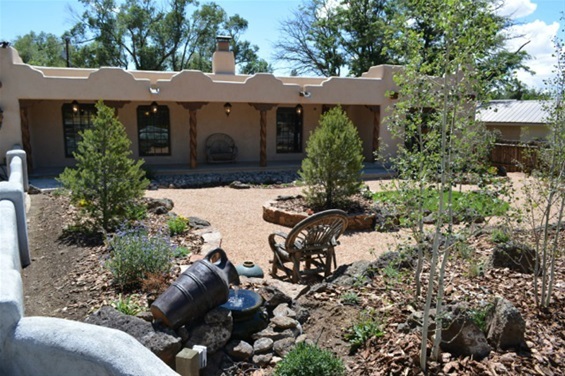 This beautiful home is in a prime location in the magical town of Taos, New Mexico.